Rabat is the capital of Morocco and is located on the Atlantic Ocean at the mouth of the river Bou Regreg. 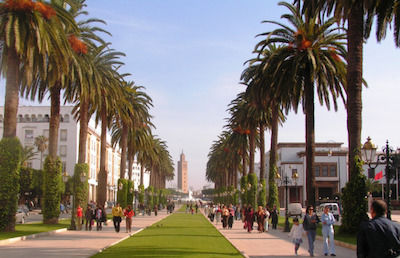 The city was made the administrative capital after the French invaded and occupied Morocco in 1912. Rabat is also one of the four imperial cities of Morocco, along with Fes, Marrakesh, and Meknes and with two million people is the nation’s second largest city. The history of the city goes back to the Phoenician (present day Lebanon and Syria) expansion, about 3,000 years ago. Rabat was built in the tenth century, near the ruin of an ancient Roman settlement near Salé. During the mid-eleventh century, an Almohad sultan established a rabat, or citadel, for his army near Salé. Sultan Yakub el-Mansur moved the capital of the Almohad Empire to Rabat, and made it the base for his conquests of Spain and North Africa in the twelfth century. This history is still visible in the city’s architecture, especially in the Moorish districts along with unfinished construction of a mosque and the Hassan Tower, both left uncompleted by el-Mansur. They are testimonies to the city’s history, grandeur, and prestige. In the early 17th century, Rabat and Salé were united to form the Republic of Bou Regreg, which stood for nearly two centuries, and was run by Barbary pirates. Expelled Spanish Muslims also migrated to the city at this time and formed the core of Rabat’s population. In the 20th century, Rabat was invaded by the French, who also established a protectorate there and opened it to extensive development to the south and west. Post 1912, the city’s population grew as did its prestige as the new administrative, educational, and cultural center of Morocco. Moroccan Independence Day is celebrated on November 18, to honor the return of Sultan Mohammed V to Morocco after having been in exile. The country gained its independence in 1956. The city is divided into two main sections, the Medina (old-walled city) and the Ville Nouvelle (new city, built by the French). Much of the economy is based on a traditional manufacturing model that included sectors of leather handcrafts, pottery, and jewelry; other industrial activities include garments, fish processing, and carpet-making. Rabati women made significant contributions to the economy as well as they created a carpet and embroidery that was named Rabati. By the late 20th century Rabat became home to several major non-governmental organizations (NGOs) that focused on human and women’s rights. These organizations helped influence much of the modern history of Rabat by organizing several significant peaceful marches, including a 2000 march that focused on changes to family law. By the end of the twentieth century the majority of the Rabati population had shifted and now was composed of civil servants, students, administrators, and diplomats. Arabic and French are the two most common languages. Rabat is also home to a wide range of foreign embassies and the major national university, Muhammad V, is located there as well along with various national research institutes. Anthony Appiah and Henry Louis Gates, Africana: The Encyclopedia of the African and African American Experience (New York: Basic Civitas Books, 1999); Susan Gilson Miller, A History of Modern Morocco (New York: Cambridge University Press); Michael Richard Thomas Dumper and Bruce Stanley, Cities of the Middle East and North Africa: A Historical Encyclopedia (Santa Barbara, CA: ABC-CLIO, 2006). Encyclopedia (Santa Barbara, CA: ABC-CLIO, 2006).